Pictures in fabric, family stories, expressions of beauty, geometric shapes, historical documentation. All these things are quilts! And quilters are experts in studying the history of famous people, families, and important places and events. Do you want to know the history of quilts, design your own original quilt, find out how they are made, how they have been used? Come to Mrs. De Wet’s quilting bee and try your hand at FABRIC ART! These books provided the background for introductory material to get the cluster started, they provide information leading to student discussions and plans for their own work, and they help to help fill in some of the academic aspects of quilting displayed in the concept web below. The facilitator might choose to emphasize any feature of the topic at the introductory meeting of the cluster. For our example, this facilitator brought in some quilts from home and others that she borrowed from friends in the community. The first quilt she showed was one her grandmother made from scraps left over from family clothing. Each piece of fabric has a history and connects closely to a family member or event. A patch showing medals won by a family war hero, another about a historical building in their town, and one showing the family coat of arms were discussed from a historical perspective. The teacher developed a great deal of interest and motivation by arranging to have a members of a local quilting club make a presentation and go over some of the basic skills necessary to get started. 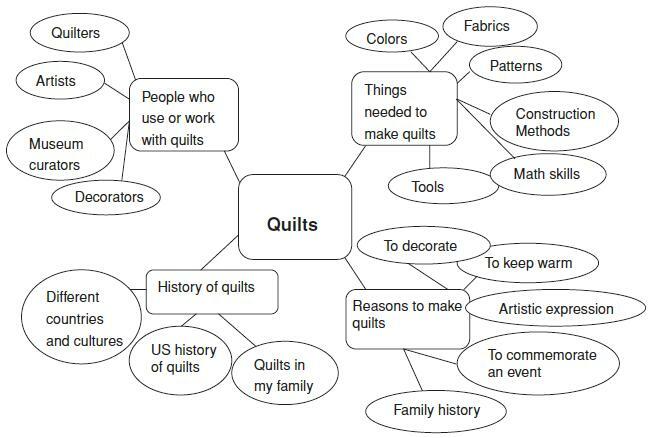 Once this web was created, the facilitator surveyed students to see which aspect of quilting interests them. Some students were more interested in the historical aspects of quilting rather than the needlework, but participated enthusiastically by researching the historical background for particular segments of the quilts that were under construction. The teacher discovered that one student was particularly interested in her own family history and decided to express this history through an original quilt. Several other students were interested in the scientific preservation of quilts and old fabric. This led the teacher to contact a museum employee who led them to find another person knowledgeable in the preservation of fabrics. One thing about enrichment clusters is that the teacher-as-facilitator follows interest-based leads. This guide-on-the-side role is very different to the traditional teacher role as a disseminator of information! The teacher asked students to gather in small interest groups and come up with a list of ideas and resources for quilts, and to discuss the research they would need to do in order to make their quilts “tell a story.” The teacher also built into the cluster planning and organizational skills by asking each group or individual to complete a Type III Enrichment Management Plan. This plan helped students to focus goals, deadlines and target dates, and explore products, outlets, and audiences for their quilting activities. One group wanted to make baby quilts to donate to a local homeless shelter and another decided to do a history of their town. The teacher arranged to have a group of ladies from a neighborhood quilting bee make a presentation to and teach students some basic skills necessary to get started on their own work. The teacher also helped to guide students in planning their activities, helped them find the necessary resources, and gain the skills needed to complete their projects. The student interested in her family history needed to learn oral history data-gathering skills to record interviews with family members. Another how-to book on this skill was ordered by the school librarian and resulted in a whole new set of academic research skills illustrating that quilting, far from being a fun-and-games subject, is a topic that embraces many historical, artistic, and sociological research skills. The students interested in family history decided to publish a small book complete with family trees and family photographs. Members from the visiting quilting bee agreed to serve as mentors and helped these young quilter historians in the construction of their projects. An exhibition of the students’ quilts was arranged at a local fabric store and some of the quilts were displayed in public buildings before being donated to a local homeless shelter. Why Is Academicizing Enrichment Clusters Important? In this day and age of relentless pressure to grind up achievement test scores at all costs, we have witnessed a growing lack of genuine student engagement in learning and an epidemic of boredom on the parts of more and more students. While our research has shown that the kinds of learning experiences that define enrichment clusters make learning engaging and enjoying; and that these experiences do, if fact, result in improved achievement, many education leaders have opted for highly prescriptive drill-and-practice approaches to test score improvement. More than a few administrators have said to me that they would like to initiate a cluster program, but test-prep in its most repetitive form must take precedence. For this reason it is contingent upon us to make certain that we can show specific examples of academic content and thinking skills in our enrichment clusters. The work that the students in the quilting cluster did on historical research, interviewing skills, geometric design, fabric preservation, and the oral and visual presentation skills used in sharing their work need to be highlighted in any reports, press releases, and presentations made about the cluster and parents should be provided with a checklist of all the important academic skills that were implicit in the work of the cluster. Fun and engagement are, unquestionably, an important goal of enrichment clusters, but we can’t leave ourselves open to criticism because of the external pressures being placed on schools as a result of test score mania! Another thing I have learned from teachers that have worked hard to academicize their clusters is that they have shown pride in the new content area knowledge they themselves have gained about topics of interest, the research skills they have acquired as a result of becoming familiar with how-to books, and finding and working with community resources. Many teachers have told me that they are applying some of the strategies used in enrichment clusters to their regular classroom teaching, and by so doing, they have observed increases in student engagement and motivation. In closing, I would like to invite you to consider sending me examples of how you have academicized one or more of the clusters that you have facilitated. With your permission, I will share your creative work with others through our web site, and in this way, we can all help one another to strengthen the case for the value of this “brand” of learning.